With each book she writes, Meg Moseley just gets better and better. 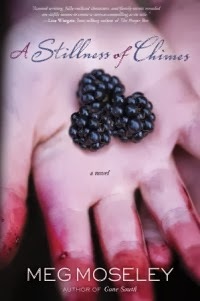 A Stillness of Chimes is her latest novel, my favorite one yet, and it is simply beautiful. The author's use of language drew me into the story right from the first haunting paragraph. A Stillness of Chimes is full of mystery, family secrets, love, and kudzu. When Laura revisits her Southern home town to handle her mother's estate, many memories from the past emerge, and Meg Moseley brilliantly unfolds the story as the truth is uncovered. The magical setting and memorable characters made me fall in love with this story and eagerly anticipate turning the next page. "The world was holding its breath. No wind blew, not even enough breeze to move the chimes. She couldn't see them, hidden as they were by shrubs, but she imagined the silvery cylinders hanging motionless among the drenched leaves" (p. 209). The plot is nicely done, with twists and plenty of questions to uncover, and the characters are realistically portrayed and made me care what happens to them. I'm looking forward to seeing what Meg Moseley writes next!